We are fortunate to have the services of our book critic, Terry Lawhead, who continues to provide us with candid, honest opinions about the books that cover a wide range of economic development, entrepreneur and business topics. Check back regularly as our intrepid reader and reviewer scans the world for the best and brightest works, eschewing a world of 144 characters to delve deeply into the issues and topics of interest to our audience. And if you have a book you think we should be reviewing, contact us and let us know. We’ll be happy to take a look at it and hopefully share it with the world, or at least those who visit The Maury Forum. This most recent book by Maury Forman (his 17th) resembles sculpture. A person with earned expertise chisels and sandblasts off useless material until the real core of valuable truth and beauty learned in a vocation can emerge. Forman has been around the block many times, down the country road and in not a few rodeos; he knows his stuff. 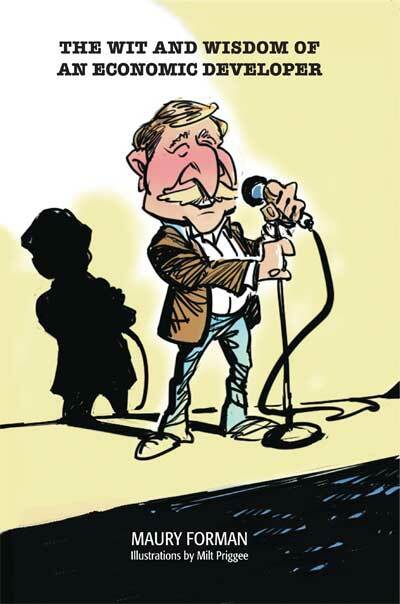 He tells it with top 10 suggestions and compliments his wisdom with images drawn by Milt Priggee that include valuable wisdom that can fit inside a fortune cookie. There are thousands of books and YouTubes and PowerPoints and conferences one could invest in on economic development yet this slim volume—fat volumes earn no gold stars from any busy person–contains a carefully written, yes even sculpted, encouragement of self-employed success, hundreds of ideas and making contributions to the resilient elements of healthy communities. And I must highlight the humor found—in print and in graphics—because we are all subjected to the misery of Orwellian, spirit flattening writing produced by government and other boring writers. Humor is human and this book is loaded with humanity about helping all ages and levels of economic development practitioners, businesses and communities and the leaderships overarching and underlying what is attempted and making a reader laugh along the way. Okay, so now a different kind of observation. The author is an inexhaustibly enthusiastic proponent of how empowered, thoughtful people of all ages can and will succeed with assistance from economic development professionals and community members. Despite some of the essays first appearing a few years ago, he is still ahead of the curve in urging the collaboration of other private and public institutions and his “Top Tens” throughout the book should be on billboards in urban and rural counties. I welcome and applaud his energizing perspective. I would encourage a reader to put this book on his or her stack of today’s crucial writings about how to approach solving or mitigating our significant problems, from helping discouraged people young and old to shutting off horrific politicians. When one gets bogged down with the necessary but less inspiring, dismally written material in many of those books in the stack, re-open this one to Forman’s insightful and results oriented checklists of the opportunities individuals can and should pursue and—as you smile and immediately feel better and once again determined–go forth with his excellent tools to achieve great long-lasting success. And if Stephen Colbert falters as David Letterman’s replacement, I would encourage CBS to look to the Northwest for a replacement. He cannot only make people laugh, he will teach them how to create a sustainable community. 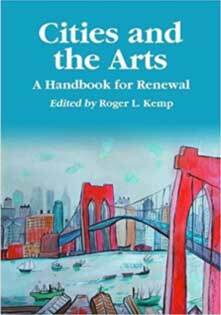 In Cities and the Arts, editor Roger Kemp has gathered articles from a wide range of sources to demonstrate that when community investment focuses on the arts, business, commerce, and tourism will follow. The centerpiece of the book is the section on best practices. Here readers will find 35 case studies on how cities and towns are using the arts to stimulate downtown and neighborhood revitalization. Examples include: Developing a master plan for the arts, Creating an arts district, Working with museums to promote cultural tourism, Building artists’ lofts to spur downtown revitalization, Developing urban cultural parks, Using public art to shape the streetscape, and more. The cities covered range from populations of just over 11,000 in Madison, Indiana, to over three million in Los Angeles. But the majority are midsized cities demonstrating successful practices for revitalizing downtown with the arts. A thoughtful reflection about proud confidence in any endeavor—child rearing, economic development, software design—is if you think it is easy you are probably doing it wrong. 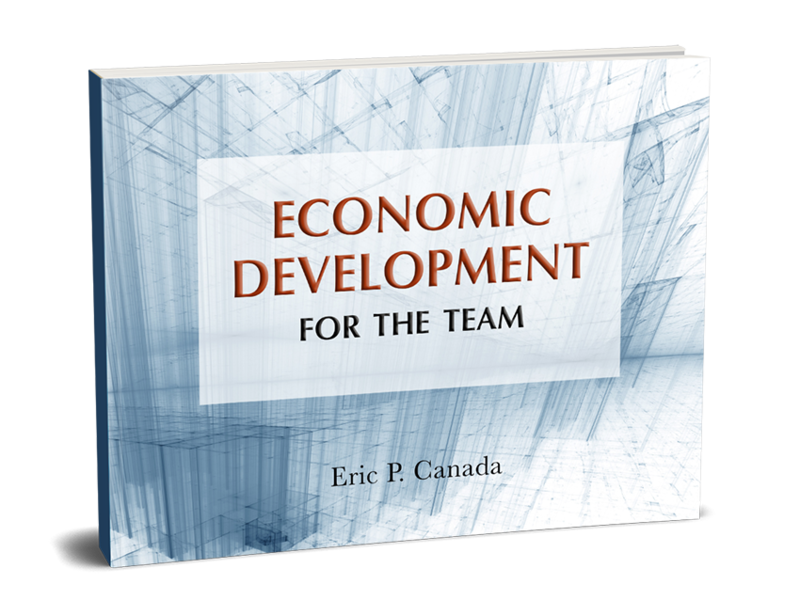 “Economic Development For the Team” by Eric P. Canada provides the reader with excellent time-tested tools to achieve success while not underestimating the complex challenges of the profession. He is admirably cautious, warning to “watch for signals of change” and noting “yet to be determined” in reference to various initiatives that could make one urgently update those time-tested tools. He also approaches metrics with a healthy respect for the limitations of data accurately capturing the incredibly detailed messiness of economic life while still providing useful guidance. I believe he chooses to, unfortunately, minimize sustainable economic development but in all fairness, it is because he covers a remarkable amount of material in this well-illustrated 220 page book. He is also a bit dismissive of the copyrighted Economic Gardening process from the Lowe Foundation and, having used it successfully, I disagree. And, due to my own focused work on rural issues, I think he doesn’t treat the issue of scale in sufficient depth by focusing predominately on the work of facilitating primary sector economic development. His emphasis is correct because that is what communities and elected leadership generally want. But many people in the profession are elsewhere in the pretty wide spectrum of economic development, i.e., those in small towns, public service staff, community advocates with overlaps in helping businesses prosper, “boots on the ground” types and state and federal managers in high rises. His take on macroeconomics is well written for the behavior of a perfect world but I assume that some of us are not in a perfect world these days. Distressed communities with their staggering challenges involve a harsh triage of deliberations more prosperous towns on an enviable roll cannot imagine. He acknowledges all of this and is a veteran of the myriad of circumstances that can emerge in this work but I would have liked a little more on how to frame priorities in those communities that lack economic generators and thus, he writes, “cease to have a reason for being.” Again, he’s technically correct but politics and inexplicable resilience with timely assistance from grants, entrepreneurs and altruistic local donors affect heroic outcomes. He acknowledges there is no common voice for this profession and any checklist to move forward is grounds for intense discussion among passionate individuals. I like how he uses the metaphor of physics to describe the dynamics of marketing but he chose not to then use quantum physics as well? I mean, it’s a natural: economic development professionals needing to be in two or more places at once, the mysteries of entanglement, local actions affecting distant actions simultaneously and connecting on phone calls in a patient and productive manner with dozens of board members and businesses while also Googling for answers to difficult questions. And let’s not forget while trying to eat lunch. 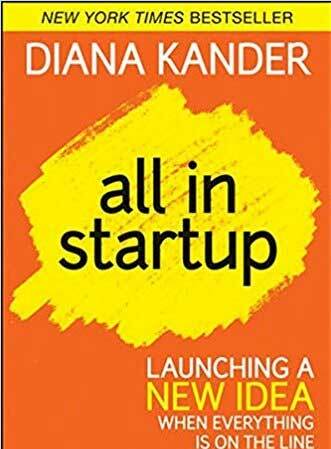 This book really is about you.Instead of relying on the tried and true examples of entrepreneurial hotspots like Boulder, Boston and Silicon Valley, the book features stories from Puerto Rico, Wichita, Fargo, Cork Ireland, western Kansas, St. Louis, Anchorage and more. Regardless of the size or strength of your community, you’ll find examples from places that are relatable. You really can measure your entrepreneurial infrastructure.Measurement becomes a reality rather than a frustrating process of nailing down Jello. Find your gaps, figure out how you’re going to fill them, start the process, and report on your progress using data you compiled. Measure what matters to YOU, not what matters to another community. It takes a village.Time and time again you’ve tried to get diverse audiences involved in building your infrastructure. This book has them all —- investors, bankers, corporations, universities, economic developers, philanthropists and entrepreneurs of all shapes, sizes and colors. Unless you’re the guy (or gal) putting peanut butter up your nose on YouTube, it’s likely you’ll see yourself in this book. GUEST BOOK REVIEWER: A thought leader in entrepreneurship and building an entrepreneurial culture, Penny Lewandowski is senior consultant on external relations at the Edward Lowe Foundation. She is a frequent speaker on new ways to think about economic development —- especially how a grow-from-within strategy leads to thriving and sustainable economies. Click here to send Penny comments; click here to subscribe to the blog. There is now a multitude of documents online that can be accessed by citizens motivated to be better prepared and more able to recover in the event of a disaster. A high percentage of them are virtually unreadable and inefficient in terms of providing a practical and comprehensive how-to checklist for regular concerned folks who may not belong to established organizations. So what happens? Readers may print them off and file them away or simply move on to other websites and communities remain vulnerable without sufficient boots-on-the-ground planning. Mitigating the impact of disasters before and after requires engaged people and communities having the confidence to work with their local leadership and neighbors and apply sensible and actionable risk assessment tools, response strategies and successful recovery outreach. It is all hands on deck. The author is an economic development professional and a veteran of challenging events in Canada—remember Fort McMurray? She was there–and shows her wisdom repeatedly by her emphasis of partnering with everybody—this short review can not adequately list “everybody” but if for some reason you think preparedness is not one of the most inclusive activities one can do, all the more reason for you to read this book. She makes a very compelling side-by-side chart of both everyday roles of economic development staff and “Roles in a Disaster”; it is worth being very organized and on your game as much as possible, you can sleep later. And, very appropriately, the author has produced separate volumes to zero in on specific issues for families, businesses and communities as well as combining all of books into one larger edition. There are routine emergencies that most jurisdictions are ready to handle with professional, paid public and private staffs. Unexpected and unprepared for disasters overwhelm all levels of government and human capacity and result in heartbreaking tragedy. 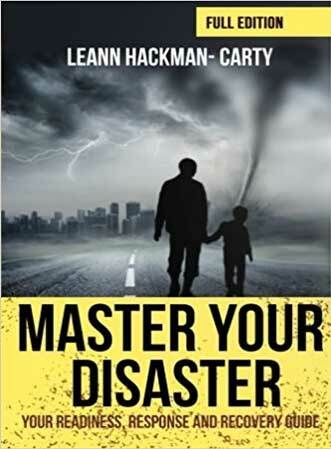 Utilizing the guidance in this unique pragmatic series of books yielding readers useful practices, goals and facilitation protocols will save your community from catastrophic losses and very possibly your life and that of your family and friends. And you will never have to print out lengthy unreadable documents off the Internet again. 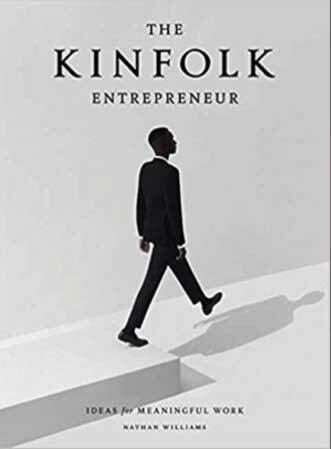 In The Kinfolk Entrepreneur, author Nathan Williams introduces readers to 40 creative business owners around the globe, offering an inspiring, in-depth look behind the scenes of their lives and their companies through interviews and stories. I have never seen a book quite like this and was prepared to not like it. I realized eventually that the book was pushing me past boundaries about a lot of my attitudes and I had to abandon reading it or stretch my boundaries. I chose to keep reading and am glad I did. One of my knee-jerk reactions to the entrepreneurs interviewed is because they operate in a world far from anything I know or will know, a world of privilege, incredibly high levels of global education and very wealthy customers and I found that unpleasant. Then I began recognizing the commonalities expressed by the people and I allowed myself to appreciate them, the challenges they have faced and the success they have achieved. 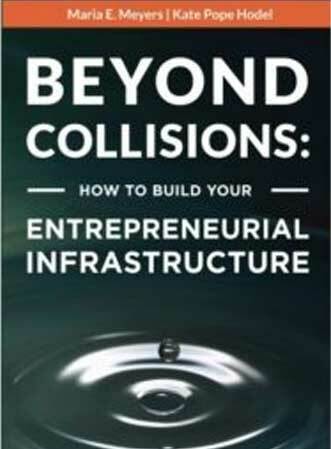 The constructive messages in this book are both common to entrepreneurial thinking and go beyond such routinely experienced advice by offering unique insights and inspiration. The stories of the careers and products and services of the individuals featured in this book are remarkable and the photographs are stunning. What is finally important about a book like this? There are those among us who aspire to levels of achievement in every possible profession that may seem unrealistic or even, if we want to be cruel, ridiculously impossible. People in this book have realized their dreams in profound ways and deserve the praise they are receiving. I have learned to never dismiss anybody with a dream but I acknowledge that if a person was aiming so high above my own experiences I tended to counsel with caution. Never again. Everything is attainable and everybody is deserving of achieving their dreams. This book is a reminder to always build something bigger than ourselves, maybe bigger than we can currently even imagine, and still be attentive and responsive to the people around us. Local investment works because we believe it does. It isn’t a physical law, like gravity or Newton’s laws of motion, which operates independent of us. Thoughtfully examined, it isn’t a mystery. We create it and sustain it and, unfortunately, can let it wither away through ignorance or neglect. 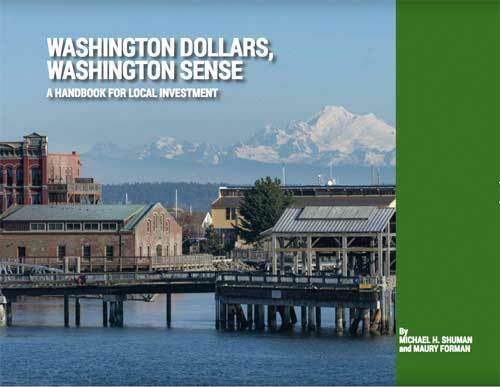 “Washington Dollars, Washington Sense” by Michael H. Shuman and Maury Forman, could not be more timely coming at a time of unprecedented and, to most of us, bewildering and frightening financial changes in local and global economies and job markets. The book is a handbook to get critical thinking and implementation done and not a philosophical treatise. However, there are fundamental questions to pose for discussion among earnest citizens. Structural problems do plague economic issues as much as ideology and opinionated positions based on inadequate or faulty information. These concerns are laid out in the book in easily understood order followed by straightforward explanations. The authors know that readers seeking information require substantive proof, not just testimonials, that the tools are credible and durable and do not present a fatal risk if they invest locally. These are tough times and Wall Street does not want to lose any of its capital to far-flung Main Streets. Clear and accurate education will make a difference at a time when virtually all news is doubted. Washington Dollars, Washington Sense contributes to strengthening those life-changing attributes of communities and producing new possibilities for livelihood and security. There are many new tools emerging for economic development professionals because there are so many rapidly changing issues to address. Unfortunately, the new approaches are also disruptors for organizations providing technical assistance. So when you learn about a new service you want to provide citizens through your organization you also find there are significant challenges to success, from varying co-worker interest to budgets. It isn’t about the data or the opportunities, there are expectations of stakeholders and diminishing capacity to meet those expectations. It can all feel insurmountable. Do you first try to change the culture of your group and or do you jump in with other means to convince others of your idea? Speed matters, of course, as does coming up with funding but depth of collaboration, or the lack of it, is the deal breaker. Ultimately it isn’t about you or you putting yourself into a leader position, even if you have put forward the idea—it is about the team. The new leaders are teams of reliable and diverse individuals. But they don’t just happen without effort. 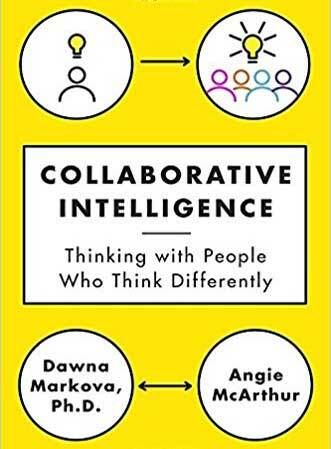 According to these authors, the mindset of Collaborative Intelligence is attention, focusing on the assets of the people with whom you work and listening to them carefully to sift through the very best of what is possible but everybody has to do this as well. Easier said than done. If your organization’s culture is changing too slowly to get a good new idea in motion, a bottom-up web of strong interpersonal connections and organizational infrastructure can move the needle sufficiently. But that web needs to be aware of each individual in pretty sophisticated ways. One way to have some understanding is to create a Team Map, similar to any asset mapping. But then employees come and go, no agency has permanence: How can operations be more nimble and durable than anything that has been tried before? The authors provide informal shortcuts in the workplace which would be invaluable in the short term thinking, electoral-driven processes we must navigate. This is an important and thoughtful contribution to internalizing innovation and disruptive change in such a way that people are empowered to be inspired to act both autonomously and collaboratively and be better able to deliver services required by our times. It is reported American businesses spend almost fourteen billion dollars annually on leadership-training seminars and consider leadership development their number one “human capital priority.” That’s a big investment in something that is rumored to be unteachable—people apparently forge leadership out of living full lives, not attending seminars. What is called the romance of leadership drives a lot of organizations, both public and private, to be fickle about choosing one individual to own the alleged authority of running things. History tells us that the complex unpredictable drama of worldly events is tricky for participants and cannot be reduced to a solvable equation. 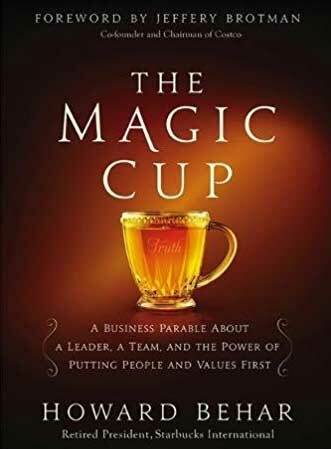 Howard Behar gives us a parable that provides for a lesson in the trials and tribulations of earning leadership virtues and he pulls it off in 139 eloquent pages of enchanting storytelling. Now, parables appear to be simplistic moral teaching but, because nothing is what it seems in parables (yet also at the same time illustrating real life challenges), excellent writing skills are required. The literal story is a CEO attempting to revive a company. The metaphorical and magical qualities of the narrative trigger the reader’s imagination and interiorize the events described. The author wants to tell us which character attributes are required in outstanding leaders and it is a real list sensible to anybody and are no doubt in all the Power Points in all those expensive seminars. But they don’t resonate and become vivid scrolled on a screen like they do when performed in a well told story that puts meaning into a succession of events. You, the reader, are in the adventure with the CEO and experience what he does in terms of dangers, self-doubts, teaming up with allies and confronting difficulties. You yourself run the course and benefit from multiple perspectives of characters you meet. Parables want to convey the importance of timeless moral codes and how right living provides the best results. But we don’t want to be lectured to about this, we want to find our own way in the maze and, at the end, be better for having made the journey. It is both a subtle and profound sensation to come to the end of an entertaining story and find you have gained new insights, perspectives and inspiration about tackling our mutual personal and societal challenges. Where do inventions and economic development intersect? And can economic development professionals do anything to affect the process? What do you think are the most important inventions for civilization? Some have said humble hay, because it allowed for human migration out of Africa to colder Europe and Asia and raise animals and, you know, eventually create the modern world. Others say eyeglasses, the printing press, the number zero, antibiotics, the vacuum flask (the modern Thermos—how does it know to keep something hot or cold, anyway? ), it is a vast list. But, really, how can one put some kind of limit of importance on the endless number of things we use every day? Things that make life miraculously easier than it was hundreds of years ago? Invented things are taken for granted but the act of inventing—and delivering on the promise–is barely understood. Luckily, it continues full throttle, described and measured in different ways. Innovation can be intimidating to risk-averse cultures and create serious disruptions but innovation needs to occur and it requires a certain amount of creative chaotic conditions. Worry is afoot: some say patents are up but the production of scientific research is down, which means global innovation may, in fact, be slowing. What does a culture need to believe in to encourage the arts of invention? One key thing is that citizens need to value and celebrate and reward the entrepreneurial spirit. Another is to appreciate the “courage of following one’s heart and intuition” (Steve Jobs said that), despite the significant risks of doing so. A successful enterprise requires many ways of engaging with the world but at its core, it has to have a way to invent itself every day. This is why Global Entrepreneurship Week (or month as Washington has made it) is so important to the economic developer. Inventions+ Innovations + Entrepreneurs = Economic Development. 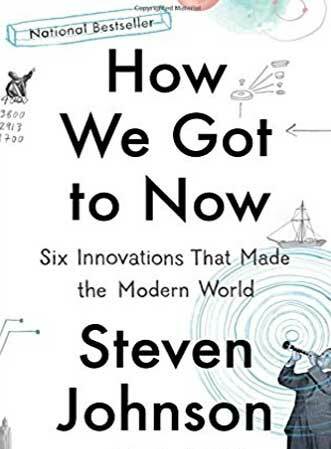 Steve Johnson does an excellent job of telling the story of how ideas came about and who the real inventors were. They have become the real heroes of sustainability and progress for our communities. 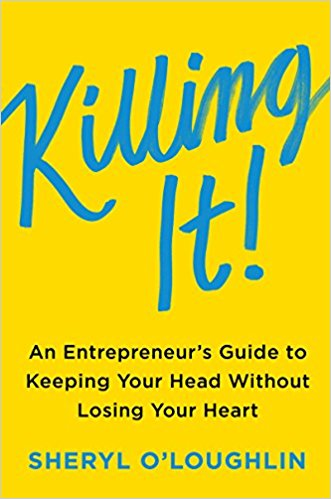 A couple things right up front and a confession: This is not literature nor is it a conventional self-help book about learning to be an entrepreneur. It is a worthy effort to combine entertaining storytelling with serious teachings but it doesn’t excel at either. It is a New York Times bestseller but can’t fit easily into a genre on bookstore shelves. The characters are somewhat stereotypical, the lessons come fast and furious without context. The confession? I wish I had thought of it. The flourishing entrepreneurial training scene needs this kind of snappy if not timeless fiction writing with the finest distilled advice from the best thinkers and doers. I took a workshop with the Kauffman Foundation, where the author works, and she puts in the best of the best coming out of that fiercely innovative institute. The problem with even compelling information is that it can be dangerously boring unless enlivened by interesting writing. The chapter headings are worth the price of the book and the sentences she has put in bold type, however clunky it looks on the page, are zingers. Favorite takeaway for me is the notion of finding the pain out there, the real deep pain or what she is terming a migraine, and produce a solution—a business–that removes that pain. Don’t aim at fixing a routine headache a customer is having, look for the agonizing migraine and solve that. There are plenty of those haunting the marketplace but keep reading: Fixing somebody’s migraine is going to be the hardest work you will ever do. Most of the other highlighted ideas and plot devices that drive the story aren’t unknown to those of us working in economic development but she has framed them in appealing, easy to grasp language and—with the sympathetic characters she has invented—encouraged the reader to care about where the story is heading. This kind of writing is going to kill dry textbook styles dead and that is a good thing. You can always pick up the Great Modern Novels Library selections over the holidays. Granted, we cannot predict the future. But the most important and long-lasting way we can influence the future is by helping children today. Children are the future living and breathing in front of us. The author believes that a couple of the favorite words of economic development professionals, “opportunity” and “social capital”, now depict a situation in serious trouble. There is less opportunity and social capital for more and more people in America. The reasons are the usual suspects familiar to anybody not living in a tomb but he introduces a rather remarkable change in our culture: the decline of “weak ties” among less educated less affluent Americans. Strong ties and weak ties contribute to community bonds and social networks but are distributed increasingly unevenly. Weak ties are connections to wider, more diverse networks, crucial for families to tap a wealth of expertise and support. Those kinds of resources are less and less accessible to those less well off due to declining links via networks. 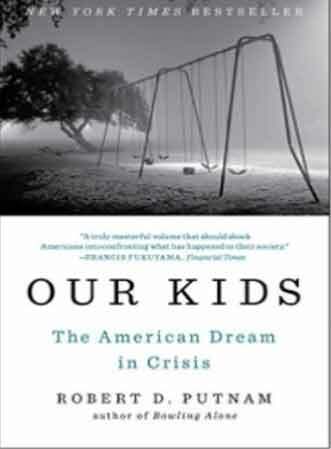 The author wrote “Bowling Alone” many years ago describing the withering of Americans’ community bonds affecting lower classes disproportionately. Access to the Internet has not mitigated this problem: personal networks and access to helpful people—mentors inside and outside of the immediate family—often matter more than the information found. There has been a longstanding romance with the idea that hard working and successful entrepreneurs come from rough-and-ready backgrounds that may have lacked the amenities of wealthier, more prestigious families in well-off communities but had strong character attributes empowering them. That was true to a certain extent thanks to how families and culture worked but it was a long time ago in a very different world. Youth now need to learn digital, networking and relationship savvy along with numerous other fundamentals from somewhere else. If informal mentoring—teachers, pastors, family friends, coaches and others–is less and less and organized formal mentoring—via economic development pushing–doesn’t step up, a large number of youth simply cannot learn the game leading to proficiency and success as an adult much less play in it. You get the picture about the consequences. There is a lot of documented sense of helplessness going on in America nowadays about the big issues we are facing. And with helplessness grows less compassion for those who are disadvantaged.